One of our most popular party favors for 50th wedding anniversary parties! 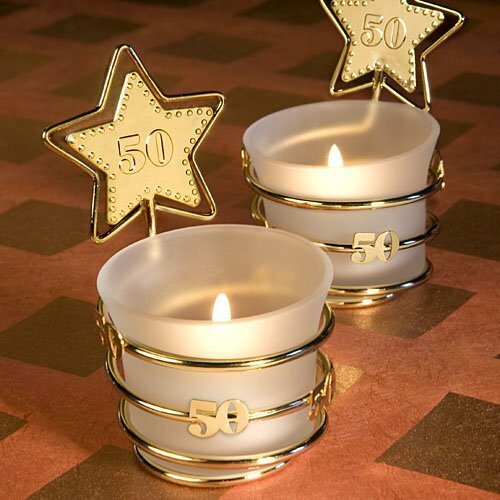 Whether it be a 50th anniversary or a 50th birthday, our gold star candle favors light the way for your special event. Each candle favor measures 3 1/2" x 2 1/4" and has a frosted white glass candle holder with a white tea light candle resting in a gold metal coiled wire base. Each comes individually packaged in a white box. Do you have this in 40th? I'm sorry we do not have the 40th version of this Gold Star 50th Celebration Candle Party Favor. do you ship your items to seychelles? At this time, we are only able to ship within the US. Do the candle Party Favors come in a gift box? Yes, the Gold Star 50th Celebration Candle Party Favors will arrive individually packaged in a white box. Each candle favor measures 3 1/2" x 2 1/4" and has a frosted white glass candle holder with a white tea light candle resting in a gold metal coiled wire base. How will the candle favor package? This Gold Star 50th Celebration Candle Party Favor will be packaged in a white box. I'm sorry the Gold Star 50th Celebration Candle Party Favor is only available in 50th design. I LOVE THOSE CANDLE BUT CAN YOU ADD ON TOP OF STAR IN PURPLE OUR NAME AND DATE OF WHEN WE GOT MARRIED? Unfortunately, we can't personalize this Gold Star 50th Celebration Candle Party Favor but you can purchase a personalized tag here. Im sorry, we cannot change the item. We do not carry any candles with 65 on it. I need to know if I can order this with a 70 birthday? I'm sorry this Gold Star 50th Celebration Candle Party Favor is only available in 50th design. How much's the weigh for 20 Gold Star 50th Celebration Candle Party Favors I have to take to another country thanks. That would be approximately 7 pounds.